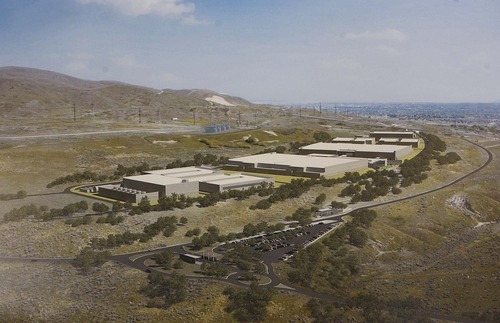 Spy agency • Officials won't say whether Utah Data Center at Camp Williams is up and running. 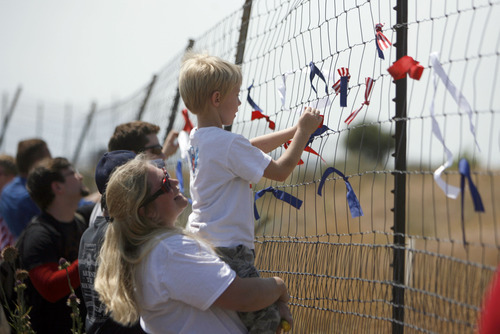 Francisco Kjolseth | The Salt Lake Tribune Red, white and blue ribbons are tied to the outer perimeter fence of the new NSA Data Center as opponents of the facility protest on the 4th of July. Francisco Kjolseth | The Salt Lake Tribune An aerial view of the NSA's Utah Data Center in Bluffdale, Utah, Thursday, April 18, 2013. T Francisco Kjolseth | The Salt Lake Tribune Dane Phillips of Las Vegas shouts "we are here because of the treason up on the hill" as he joins other opponents of the NSA Data Center for a peaceful protest on the 4th of July, after being moved to the Utah Veterans Memorial Park by highway patrol to rally before taking to the street and marching up to the Intersection of NSA Data Center access road and Redwood Road across from Camp Williams. 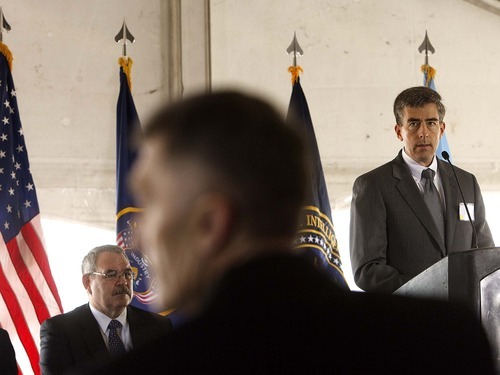 Trent Nelson | The Salt Lake Tribune John Inglis, Deputy Director of the National Security Agency, speaks at the groundbreaking ceremony for the NSA's Utah Data Center at Camp Williams, Thursday, January 6, 2011. The cybersecurity facility is expected be completed and open October 2013. 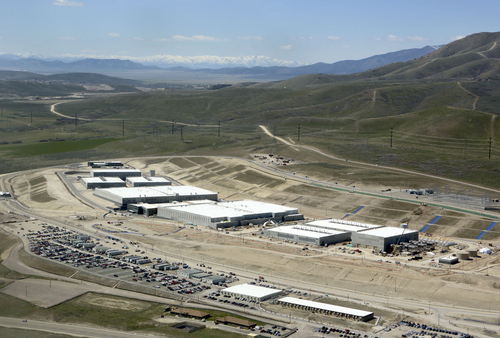 At left is Thomas Bell Francisco Kjolseth | Tribune file photo An aerial view of the NSA's Utah Data Center in Bluffdale, Utah, Thursday, April 18, 2013. 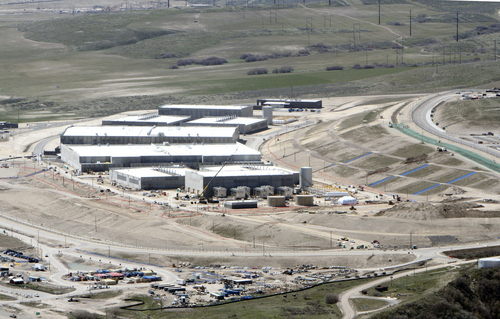 T Artist's rendition of the National Security Agency's Utah Data Center at Camp Williams, Thursday, January 6, 2011. The cybersecurity facility is expected be completed and open October 2013. Washington • Don&apos;t look for balloons or a big "Grand Opening" sign outside the National Security Agency&apos;s new Utah Data Center. The facility is expected this fall to quietly begin sucking in massive amounts of information for the intelligence community and storing it in the cavernous buildings in Bluffdale, according to NSA officials  and it could be open now even as the agency faces scrutiny over efforts to collect data on Americans domestically. NSA officials declined to say whether the center is already online, but the secret agency isn&apos;t known for celebrating the opening of classified buildings. "We turn each machine on as it is installed, and the facility is ready for that installation to begin," NSA spokeswoman Vanee Vines said recently in an interview. The data center, one of several large computer facilities run by the agency, is one of six major hubs for the NSA and will not only serve as backup storage but also be networked into the government&apos;s intelligence gathering so analysts from other sites can access it in real time. The $1.5 billion building, based on the Utah National Guard&apos;s Camp Williams straddling Utah and Salt Lake counties, will be the NSA&apos;s largest computing center in the world with about 1 million square feet of space, a tenth of that taken up by computer servers. But the Utah center opens amid a firestorm over the NSA&apos;s data collection after news reports, mainly in The Guardian and The Washington Post, revealed classified documents showing the agency is collecting data about Americans&apos; domestic phone calls and is able to tap into social-media platforms in its searches. Sen. Ron Wyden, an Oregon Democrat who sits on the Senate Intelligence Committee and has been critical of the NSA&apos;s methods, said this week that he plans in the next few days to sketch out what authority the agency is using to justify its collection of domestic intelligence and that hearings will be held. "There is no question there is going to be increased scrutiny of these kinds of practices," Wyden said, "because Americans understand this is a dangerous time, but the government, if it&apos;s going to collect [this information], ought to have to say here&apos;s how it contributes to security of the American people. They have not made that case." A week before former NSA contractor Edward Snowden began leaking classified information on the agency&apos;s previously secret activities, Deputy Director John Inglis said that the Utah Data Center should be welcomed to the state because it plays such a critical role in protecting national security. Folks who live in its shadows or see it while driving on Interstate 15 or Redwood Road shouldn&apos;t fret, he said. 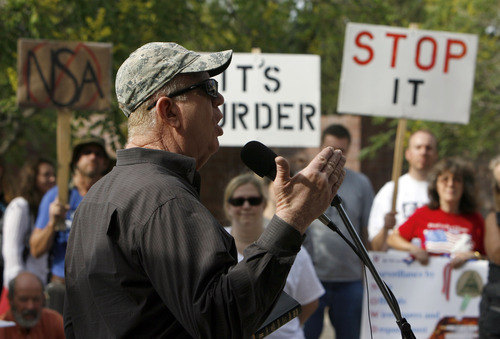 "They shouldn&apos;t be worried because, A, we&apos;re Americans," Inglis said. "We understand what the principles are that govern the nation; [and] B, we take an oath to the Constitution, and we take that very seriously." Inglis added that the agency tells its employees it&apos;s "not just important that we do something ... it&apos;s important that we do it the right way. We have to do it in a principled manner." Some Utah politicians have been invited to tour the facility and were there for a ceremony earlier this year to mark the multiyear project&apos;s completion. The event was closed to reporters and some local officials. Bill would kill NSA program • Spying by the National Security Agency has cost the United States economically and angered allies, a bipartisan group of senators said Wednesday in unveiling legislation that would end the collection of millions of Americans&apos; phone records and data on Internet usage. Three Democrats  Oregon&apos;s Ron Wyden, Mark Udall of Colorado and Richard Blumenthal of Connecticut  and Republican Rand Paul of Kentucky outlined their legislation to end longstanding NSA surveillance practices and open up some of the actions of the secret federal court that reviews government surveillance requests. The lawmakers argued that their bill is the appropriate response to disclosures this past summer about the sweeping surveillance programs  one that gathers U.S. phone records and another that is designed to track the use of U.S.-based Internet servers by foreigners with possible links to terrorism. Headed to court? • Supreme Court Justice Antonin Scalia said Wednesday that the courts ultimately will have to determine the legality of surveillance programs by the NSA. And he says he&apos;s not sure that&apos;s a good thing in an era of complex security threats against the U.S.
About 200 people, mainly technicians, are expected to work at the Utah Data Center, which is closed to the public and protected by NSA&apos;s police force.